Keely from DPaW pointing out the features of the sea turtle nest. 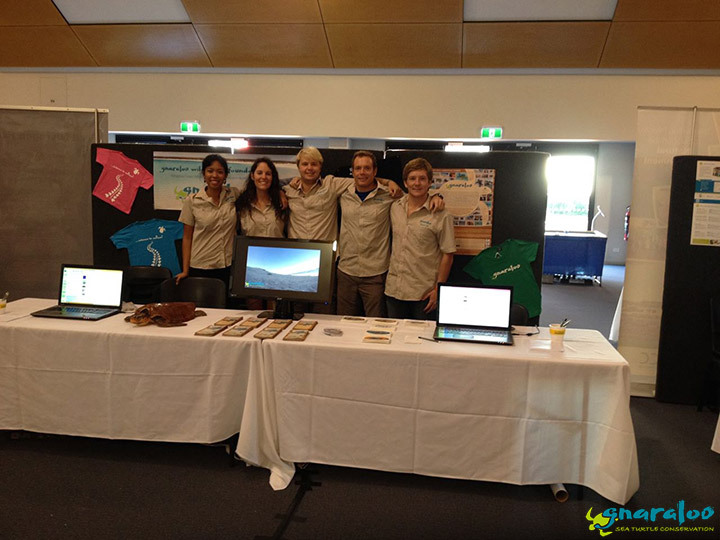 The GTCP team was excited to have two special guests join us at Gnaraloo these past two days – the Ningaloo Marine Park Coordinator for the Department of Parks and Wildlife (DPaW), Dr. Peter Barnes, and Keely Markovina, who is the volunteer coordinator and Trainer of Volunteer Turtle Trackers for the Ningaloo Turtle Program (NTP) in Exmouth. 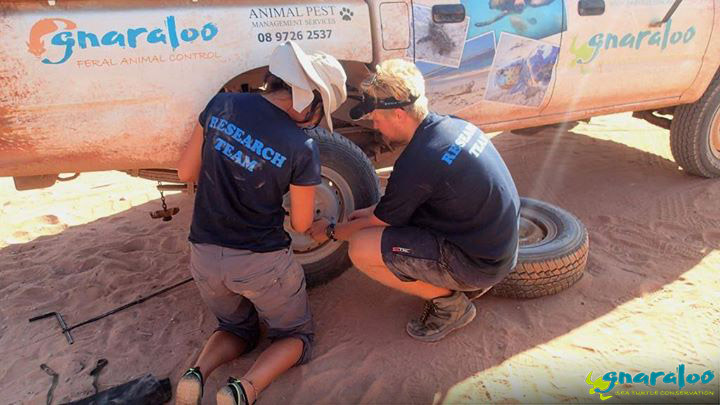 Our guests made a five hour drive from Exmouth to Gnaraloo, having sacrificed one good tyre along the way! 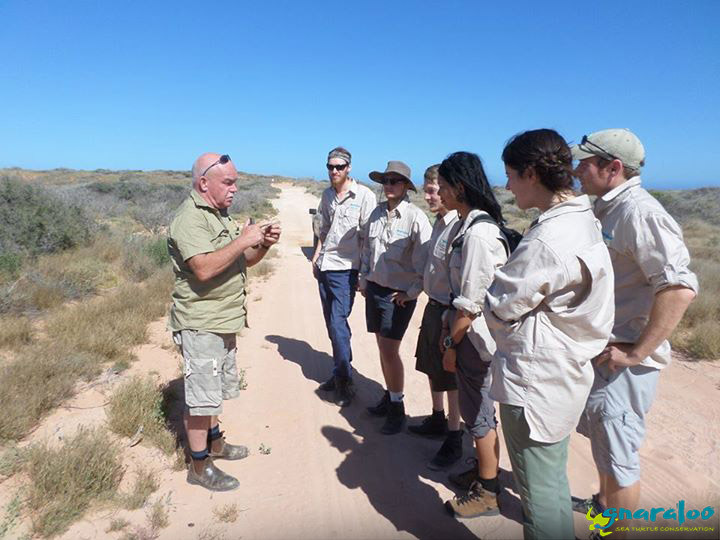 It was great to welcome back Keely who trained the first two Gnaraloo Turtle Conservation Program teams, as well as Gnaraloo’s leaseholder, Paul Richardson, on NTP’s beach monitoring protocols in 2008/09 and 2009/10. On this trip, Keely provided us with some additional training on turtle track interpretation to complement what we had received earlier in the season from former GTCP Interns – Careena Crossman and Andrew Greenley. The meeting also gave both groups the opportunity to update each other on our respective programs, exchange ideas and experiences, and build a closer relationship. Each group presented on their procedures, work progress, and gave a summary of the annual number of nesting sea turtles and species composition in their regions. 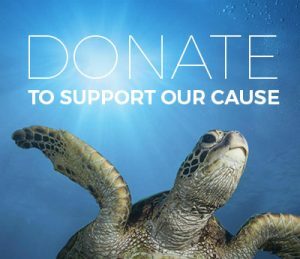 In Exmouth, the primary nesting species are endangered Green turtles (Chelonia mydas), with few sightings of critically endangered Hawksbill turtles (Eretmochelys imbricata), endangered Loggerhead turtles (Caretta caretta) and endemic/data deficient Flatback turtles (Natator depressus). Data deficient means that there is not enough information available to assess the status of a population. At Gnaraloo, by contrast, Loggerhead turtles makeup more than 95% of nesting females, followed by Green turtles (3%) and Hawksbill turtles (2%). At 5 am the following morning, everyone made their way to the Gnaraloo Bay Rookery to conduct a joint survey for sea turtle tracks and do some additional practical training. Luckily, there was one track waiting for us at the northern end of the beach, which we identified as a successful nest. The tricky part, however, was identifying the species because the tracks had features common to both Loggerhead and Hawksbill turtle tracks. 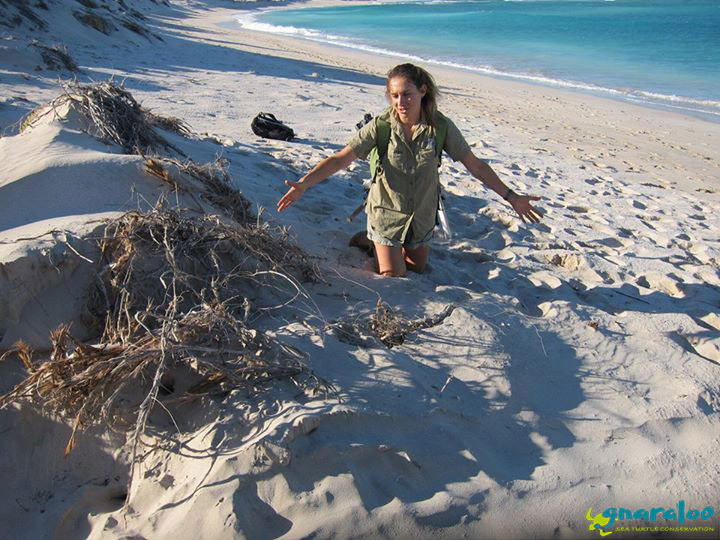 In the end,both the GTCP and DPaW members decided it was most likely a Hawksbill turtle nest. To attempt to confirm, we marked the nest and will monitor it daily for signs of hatching – if we can catch a glimpse of the hatchlings as they emerge, we’ll know for sure. After spending the morning together on the beach, swapping stories and sharing knowledge, it was time to bid Keely and Dr. Barnes farewell. We wish them a safe trip back to Exmouth, this time without having to sacrifice any tires! Everyone trying to identify what species the sea turtle nest belongs to. 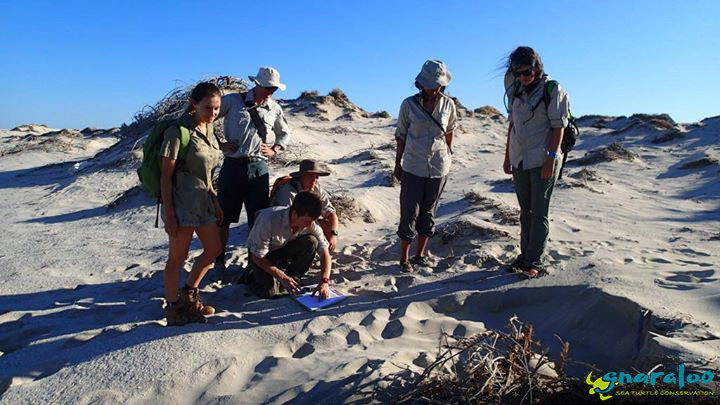 previous post: GTCP 2015/16 Daily monitoring of Gnaraloo Bay Rookery officially begins!